In line with Trumpâs pledge, the Pentagon later announced it was suspending planning for the annual Ulchi Freedom Guardian exercise that was slated to begin in August. âThe estim ated cost of the exercise was to be approximately $14 million,â Major Carla Gleason, a Pentagon spokesperson, said on Friday. 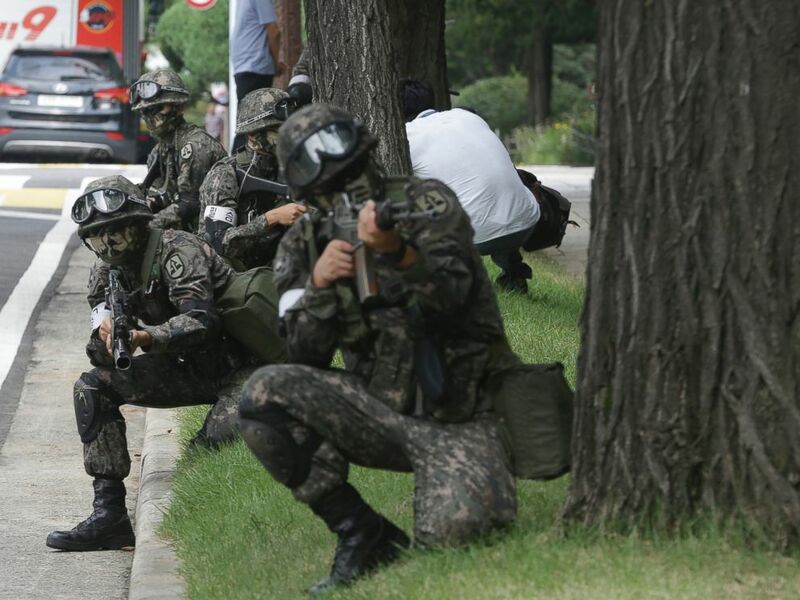 In this Aug. 24, 2016 file photo, South Korean army soldiers conduct an anti-terror drill as part of Ulchi Freedom Guardian exercise, at the National Assembly in Seoul, South Korea. Until now Pentagon officials had been unable to provide a cost estimate for the exercises noting that its funding came from various military service budgets. âMajor joint exercises involving forces traveling around the globe to exercise with our allies and partners over a period of weeks or even months can cost up to $20 million or more depending on th e exercise,â Gleason explained. Mainly a computer simulation exercise, Ulchi Freedom Guardian still involves thousands of American troops. Last yearâs version of the exercise involved 17,500 American troops, most of them already based in South Korea.